Okay, I need some guidance here. I found my way to the World Championship of Fantasy Football (WCOFF) site this weekend and am seriously considering getting involved. 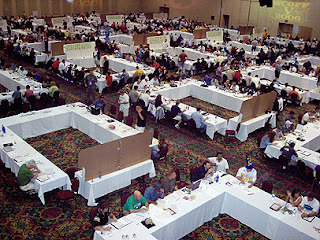 The WCOFF 2007 will have over 70 leagues of 12 teams that will hold an in-person draft in Vegas (or Atlantic City or Orlando) and compete during weeks 1-11 for the title of World Champion and more than $200,000 in prizes [pic below from 2006 draft from WCOFF site]. If I'm reading everything correctly, anyone can sign up as long as they can come for the draft in September and plunk down approximately $1800. And I'm actually thinking about this - and if I do it, it will be with my husband as my co-manager. For those who don't know us, and even those that do, spending $1800+ is not a trivial thing since we're not exactly rolling around in a bathtub full of benjamins over here...but this is so tempting. I mean this would be priceless - such an experience. Just not sure I can justify doing this. If anyone out there has been involved in WCOFF in the past, I would love to hear your commentary - was it worth it? Are outsiders/first-timers welcomed? Any general advice? And for the rest of you, like my sister - am I insane for considering this? There is no barrier to entry with WCOFF. I have been out to Vegas to do this 4 out of the 5 years they have held it. The level of fantasy football "geekness" is high. But if you like talking fantasy with beer-bellied men, then its for you. Vegas in itself makes it worthwhile, and I never spend much more time with these guys than the draft. Know the scoring system; its a PPR league. Know the free agent pickup system ; blind bidding. Bottom line is that you'll need some luck. Overall return on investment is questionable. In order to recover your initial layout, you'll have to place 2nd in your league at least. But the guys who put it together are quality people, and there are lots of other ways to win cash other than your league itself. They have highest scoring league prizes, overall point scoring prizes, and a couple of post season contest as well.